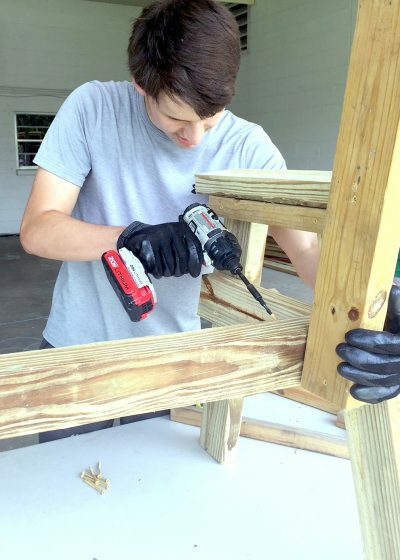 Thanks to the efforts of a 17-year-old Boy Scout, the Firehouse Cultural Center has a new gazebo. 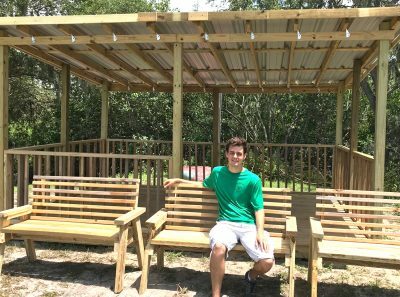 Seventeen-year-old Will Furby, of Apollo Beach, sits in front of the 10-foot by 15-foot gazebo he, family members and fellow scouts from Boy Scout Troop 661 built for the Firehouse Cultural Center as his Eagle Scout Project. 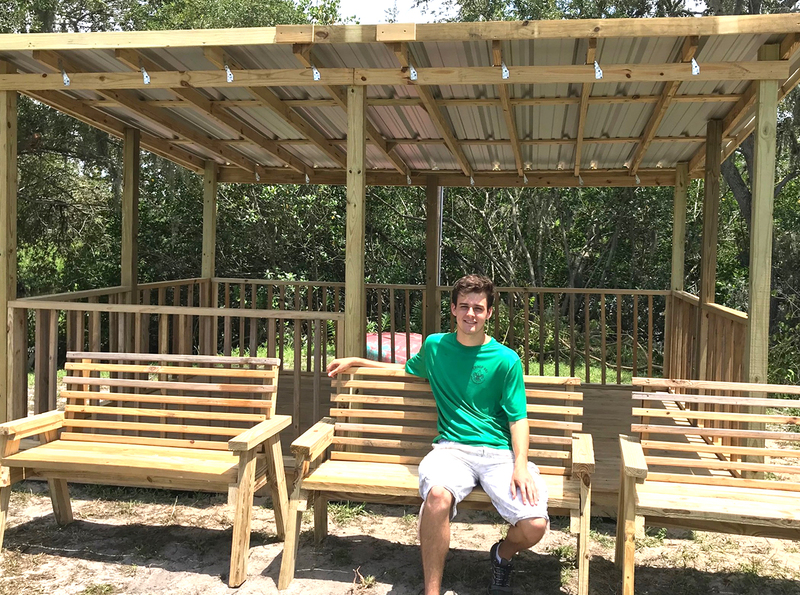 With the help of family members and fellow Scouts in Troop 661, Will Furby, an incoming senior at East Bay High School, built the structure as the focus of his Eagle Scout Project. Eagle Scout David Amshel, 17, a friend of Will Furby, works on one of four benches built for the Firehouse Cultural Center gazebo. The complex project is required by the Boy Scouts of America for a Scout to achieve the organization’s highest rank. It’s designed to show his ability to lead others through an act of service that directly benefits the community. The folks at the Firehouse are delighted with the result. It all began months ago when a friend of Furby’s mother suggested he approach the cultural center to see if there was a need for his service. After discussing various options, the building of a gazebo was chosen. After taking with his Scoutmaster, George Smith and his mentor, Assistant Scoutmaster Davis Mortus, Furby came up with a rough design and submitted it to the local Boy Scout Council for approval. He had to figure out what materials would be needed, project their costs and raise funds to either purchase them or acquire them as in-kind donations. 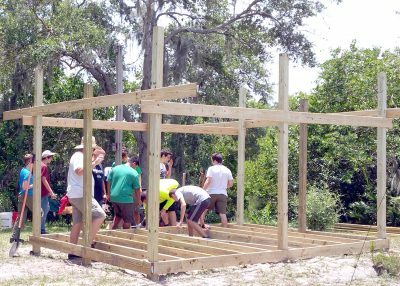 Contributors included Lowe’s, Home Depot, 84 Lumber, All Steel Buildings & Components, the Manatee County Jail, family members and friends. Will estimated total expenditures would be about $2,000. “A 5-pound box of screws costs between $50 and $60,” he said. The gazebo was built under Furby’s direction. The structure and four benches for visitors to sit on were completed July 22. Only a follow-up landscape planting remains. Boy Scout Will Furby, right, checks the alignment of the first sheet of roofing to be installed over the new Firehouse Cultural Center gazebo completed July 22. His family will then set up an official ceremony. 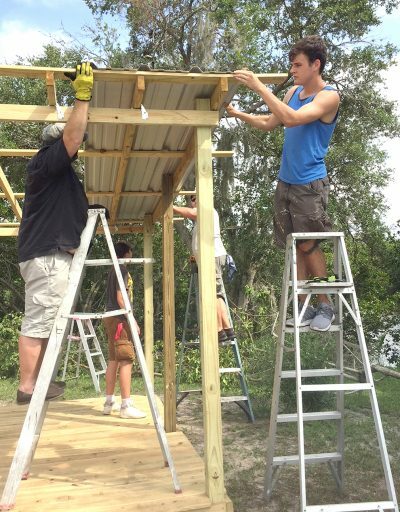 Will Furby’s fellow scouts help him build the frame of a gazebo for the Firehouse Cultural Center. Furby was responsible for the design plan and executing it through his leadership. It’s been a long path to Eagle Scout for Will Furby. He became a Cub Scout at age 8 and has risen through the ranks ever since. Furby is currently a member of East Bay High School’s U.S. Army JROTC. After graduation, he plans to join the U.S. Air Force and specialize in computer science. “He’s a good leader,” Carey said. “When it was his time to be senior patrol leader, he definitely excelled in showing his skills. He wasn’t afraid to take charge and he took pride in working with the younger boys.